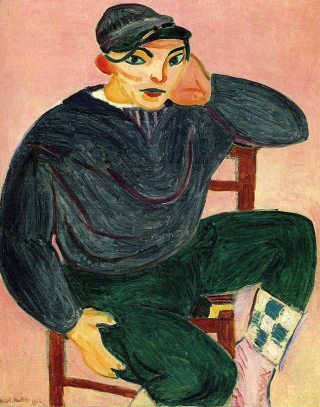 Henri Matisse was already considered the leader of The Fauves (French for Wild Beasts) when he painted The Young Sailor in 1906. This movement, considered avant-garde at the time, reduced painting to simple forms, gay colors, and unrestrained brushwork to interpret nature and realism. The model is an eighteen-year-old fisherman, from a small Mediterranean village. Thoughtful observation reveals rather theatrical looks of the subject, his green and blue outfit is set against the pink, candy-colored background, which seem to push Matisse’s decorative Fauve agenda.